Locating places in our lives to find extra money or time is a quandary that doesn’t have a completely quick solution. At the opposite side, those who are struggling with poverty are perpetually mindful to keep food on the table and a roof over that table. The Fifth Week looms several times a year. Creativity can make it through or defeat can bring even more stress and misery. Life skills and experience have given me a wide collection of tips that can help you develop your own strategy. 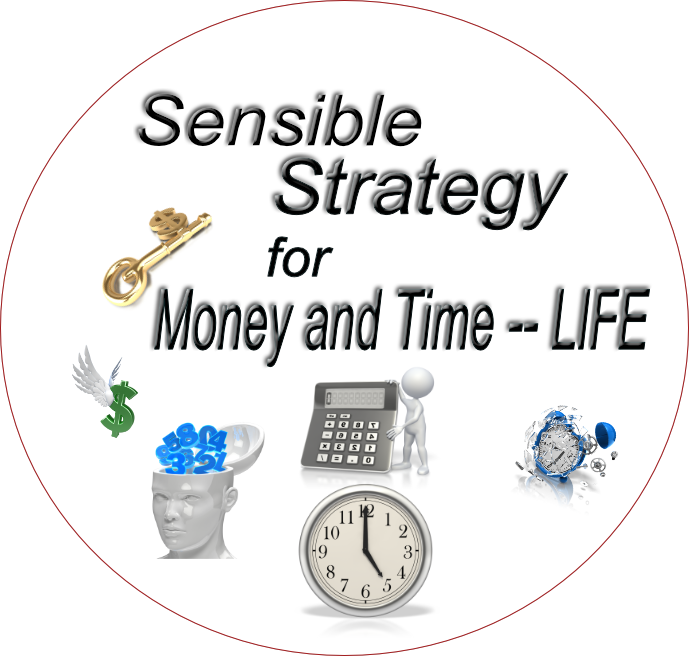 At Sensible Strategy, you will also find strategies other have built to gain their comfort level and with that peace and success in whatever they do. We’re not in a competition for the MOST, but endeavoring to learn the techniques that have worked before. And how to apply them to our individual situations. Sensible Strategy had a bit of a beginning over 10 years ago, but things seemed to fizzle out. The small flame of vision faded, but not the total dream. The domain stayed in place and did some small dry work over the years. The time of waiting is coming to an end…we’re ready for the sleeping giant to awaken. We use affiliate links to advertise products on this blog. If you see a link, you should assume that it is an affiliate link and that I would be paid a commission if you were to make a purchase through the cookies that go with the link. That commission will not affect the price you pay for your purchase. I am an affiliate with Amazon.com. If you see a link or an ad in my posts or pages — assume it is an affiliate link (frequently Amazon). If you click on any links and make a purchase, I will receive a small commission…your purchase cost will not be affected. Winter passion for comfort food and a tight budget can work together. Staples such as rice, beans, pasta and macaroni, varied types of flour and cornmeal are low cost necessities to keep in your pantry. They pair up with vegetables and meats beautifully. They will even work together to create comfort food for dark winter days. I enjoyed finding cooking websites. Favorites and new friends have some dishes that let ingredients and budget team up for tasty nutrition at your table. At Making Sense of Cents, 2017, Michelle Schroeder shared 10 budget friendly recipes that rate high on my comfort food list! The dishes offer spices, beans, rice, pasta and economical meats for family enjoyment. A few gourmet touches including quinoa and pesto bring variety to the budget table. Some of them are similar to meals that my family has enjoyed for years. A bonus recipe about hamburger and macaroni bring pretty, spice and tummy warmth without any ‘processed helpers’. That combination is a longtime family favorite, but I see some upgrades that I know we will enjoy trying. In December, 2018, Kristin King and penguins, at Dizzy, Busy and Hungry, updated a 2014 recipe for Chicken Pesto Broccoli that royally fits any budgets. She a huge collection of recipes and cooking information that readers enjoy. I haven’t tried many of them personally, but the pictures are tempting. In addition to the recipes, Kristin has back-up information — shopping lists for gifts, reviews of cooking equipment and a meal planning printable. When I’m fixing winter weather food in the Ozarks, I go even further back in time to 2009. We especially love Martha Stewart’s Buttermilk Cornbread recipe. 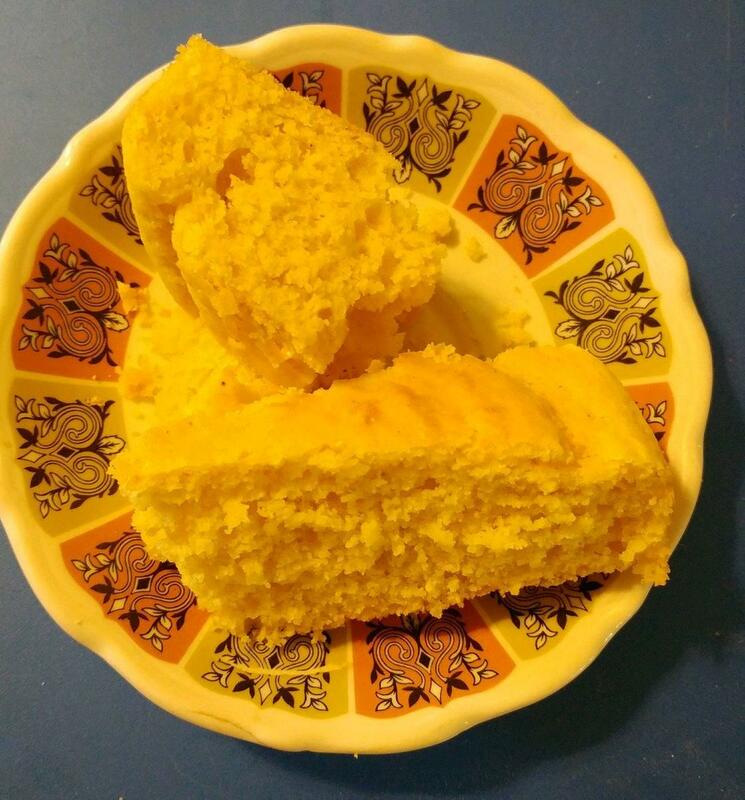 Quick and tasty — the fluffy texture has my husband promising that he will rate my cornbread blue ribbon! My final cornbread is helped by adding a missing teaspoon of baking powder from the online recipe. Our daughter likes to use an electric mixer to get fluffy cornbread. I’m lazy enough to take a big whisk to the eggs, then again to eggs and buttermilk. But, the CROWNING touch is to arrange the batter with a shallow spot in the middle. At 400 deg Fahrenheit, the edges begin to set up and bake before the center. Center batter is squeezed into a sort of peak in the middle of the pan. When I push the batter toward the outside of the pan, there is not broken peak with dry edges. 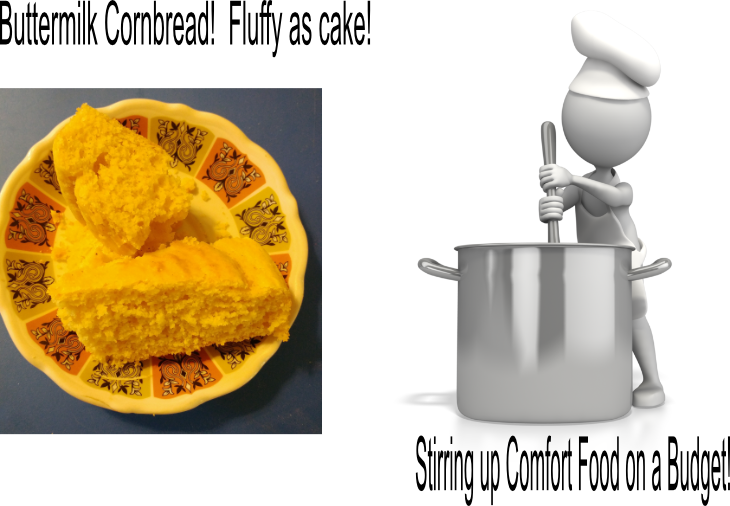 Instead, we enjoy a level, equally fluffy pan of cornbread. I like all of the foundation ingredients for blustery weather cooking — yummy pasta, sturdy beans, exotic quinoa. But this year Jasmine rice with its delightful popcorn scent is a particular favorite. I wrote about rice growing at Ozarks Mystique — Rice in the Ozarks. There can be no doubt that Basmati rice is the favorite with that fabulous scent when it cooks. However, we’ve found affection for Jasmine Rice which is easier for us to find on our market shelves in the quantity we need. I would gladly enjoy any of the recipes on a blustery winter day or long cold evening. They are mixtures that meet the tests for family pleasure or for guests! Not only are they economical in ingredients, the preparation processes are efficient to save energy and time for the cook. Fellow bloggers, Michelle Schroeder and Kristin King are hardworking, busy women. Serving nutritious, attractive food with shorter preparation times boosts the time economy for their families. Presentation can be ‘everything’ in a luxury restaurant or in a cozy family kitchen. A pleasing dish can include color, flavor and economy. There are many little things you can do with ingredients to make sure you get to choose economical nutrition that isn’t ‘gray gack’ on the plate! Peppers are some of my favorite ‘brighteners’. I purchase a few bright bell peppers for eating fresh AND chopping into little chunks for cooking. A jalapeno can be seeded and chopped extra fine. The chopped peppers don’t take much space in the freezer. They add bits of POP to dishes along with flavor and texture. Besides the frozen bits, I check out the aisles for canned or jarred peppers. There are some low cost and excellent fire roasted choices that save time and money for my cooking. When we’re pinched for time, l like to fall back on canned meats. I especially chose canned fish and chicken. These tools can have food ready much faster. I am fortunate that my family likes eggs which can be used quickly to create a protein rich meal with some bright yellow colored yolks. I like to shop the economy aisles or thrift shops for brighter plates and bowls to use during blah winter days. The shorter daylight times can be eased with some color. Watch for the email confirming your subscription. You will not be added to the email list without confirmation.